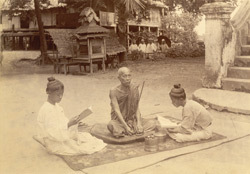 Photograph from the Curzon Collection, of two youths receiving instruction from a Buddhist monk or pongyi in Burma (Myanmar), taken by Watts and Skeen in the 1890s. Theravada or Doctrine of Elders is a school of Buddhism which draws scriptural direction from the Pali Canon or Tipitaka, acknowledged to be the oldest record of Buddha's teachings. Theravada Buddhism is Burma’s state religion, becoming established during the reign of King Anawrahta in the 11th century. The Buddhist monkhood or Sangha are accorded a reverential status in Burma and occupy an important place in the religious and secular life of the nation. Every Burmese boy spends a period of time living as a novice in a monastery. In the 19th century the monastery was the focal point of a community and traditionally also the centre for education until the British introduced a formal education system.